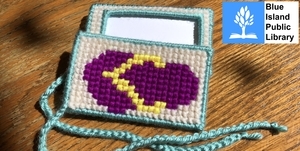 Introduction to cross-stitch luggage tags! Once you learn how to do it, then you can cross-stitch just about anything! We will be exploring our imaginations with these flip flops on Friday, July 13th from 11:00a—1:30p!